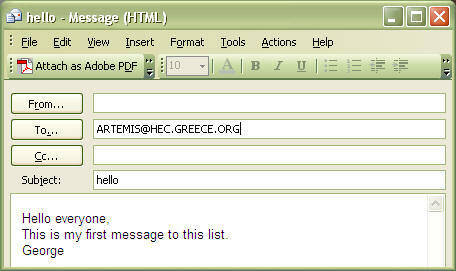 The Hellenic Electronic Center (HEC) discussion Lists provide a forum for exchange of information about various subjects concerning Greece and Greeks at home or abroad. Please note that the Lists are being moderated according to the list subject. HEC, and the List "owners" are not legally responsible and the personal opinions expressed in this discussion forum are not necessarily the opinions of HEC or the list owners. All posted messages are property of HEC according to copyrights. 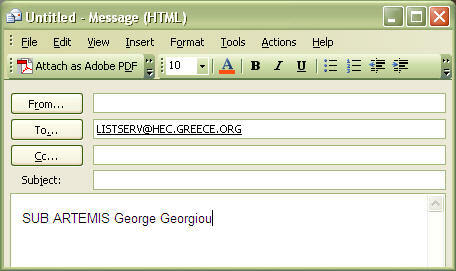 To post and read a specific HEC list you MUST first register (subscribe) to a list..
with only one command line in the body of the email (subject is not required). 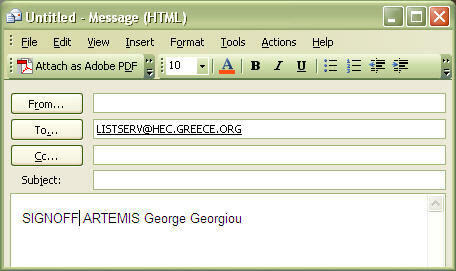 Here are some basic listserver commands for a list called: "ARTEMIS"
For Personal Help, If you have any questions about registration or any other problems, please write to us. Copyright © 1996 HEC All Rights Reserved.